I am not making this up, seriously! 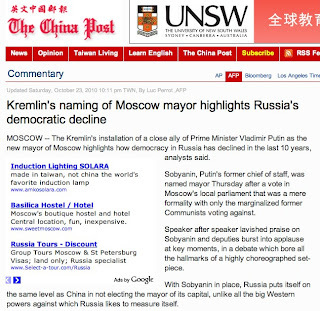 Russia puts itself on the same level as China in not electing the mayor of its capital, unlike all the big Western powers against which Russia likes to measure itself. With the liberal opposition not represented in the Moscow parliament, ironically it was left to the Communists — the remnant of the party that once ruled the entire Soviet Union — to gripe about the methods used. You see, even the communists are not happy! Why Are Russian Roads So Expensive?